Singer 20 Toy Sewing Machine. It was also formatted to its original size 3.25" x 5.5". Manuals are done in antique beige. CONTENT: This 8-page long 1922 booklet provides sufficient information and illustrative graphics needed for proper machine operation. On newsprint with all the great covers intact. Cloth cover is in excellent condition. Content: While the 1910 & 1914 instructions provide essential information for machine operation, they are only 2-pages long and lack graphics. They are best used to enhance an antique Singer miniature sewing machine display. 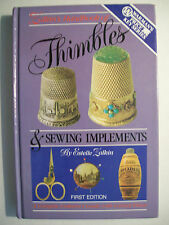 ANTIQUE THIMBLES & SEWING TOOLS PRICE GUIDE COLLECTOR'S BOOK. HARDBACK BOOK WITH 274 PAGES. It is as useful as it is nostalgic! Filled with simple "first" projects for the new seamstress or tailor. VINTAGE 1948 BATES FABRIC DEALER ADVERTISING BOOK! SEW SCHOOL CLOTHING! POSTERS! SEW SCHOOL CLOTHING! 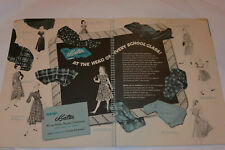 A terrific collection - A 1948 BATES FABRIC DEALER ADVERTISING BOOK! THIS BOOK PROMOTES SCHOOL, KINDERGARTEN TO COLLEGE, CLOTHING MADE OF BATES FABRIC. THIS BOOK WAS SENT TO DEALERS TO PROMOTE BATES FABRIC. WITH PICTURE'S WITH PRICE GUIDE. WITH PRICE VALUES & PICTURES - FULL SIZE HARDBACK BOOK The range of thimbles shown in this book is wide. Sections are devoted to gold, silver, brass, ivory, pewter, and china thimbles. Another section shows advertising thimbles - many of which are aluminum or plastic. The author was a noted collector and her history of these little gems is excellent and well researched. The book contains glossy color photos of hundreds of thread winders. "Thread Winders, A Collector's Guide" by Diane Pelham-Burn. For your consideration is this booklet on Bias Tape. They start with what the thimble is made of and each chapter then shows a wide range of possible thimble styles and nationalities. Thimbles of silver, gold, aluminum. by William & Magdalena Isbister. For your consideration is this booklet by JP coats. The authors have put together many years of serious thimble research into these works. by William & Magdalena Isbister. New "More About Thimbles" Reference Book Vol 1. Islamic thimbles and. blackberry thimbles. Albert and his wife Lillian were pioneers in the field of button collecting and were known nationwide. Over 3200 buttons are pictured actual size with known back marks and relative values shown. Author: Alphaeus S. Albert. A NICE 1931 ADVERTISING SEWING BOOK WRIGHT'S BIAS FOLD TAPE SEWING BOOK #26, GOOD CONDITION. "SIMPLICITY SEWING BOOK". INSTRUCTION MANUAL.SEWING. CUTTING, SEAMS, FACING, CORNERS AND MUCH MUCH MORE. MANY DETAILED PICTURES OF HOW TOO. THE BLACK PAPER ON THE SPINE IS LOOSE A LITTLE AT THE TOP. The bible book of buttons is back in an updated and revised sixth edition. This is the best introduction to the world of buttons that has ever been written. Over 3,000 buttons, covering all periods, materials, and manufacturers, are pictured and identified, along with newly revised current market values for each button. This unique book outlines the history of children's sewing and features over 700 full-color photographs of sewing sets, dolls, toys, books, and patterns. You will find details on sewing sets featuring mannequins, as well as sets with dolls made of bisque, composition, hard plastic, paper, celluloid, cloth, and rubber. "LET YOURSELF SEW".WITH SIMPLICITY. BY: SIMPLICITY PATTERNS. 1971 MAGAZINE/BOOK. 1950-1951, Aunt Ellen's Needlework Book with wonderful color and black and white illustrations of a host of needlework crafts as well as others including sequin/beading, transfers, and more! Warman's Price Key Series is a 1st edition © 1988 from Warman Publishing Co., Inc. from Willow Grove, PA. Hardcover book with B&W photos with 16 color plates. In excellent pre-owned condition with no writing, tears, bends or odor. "SIMPLICITY SEWING BOOK". BY: SIMPLICITY PATTERN CO., INC. USED MAGAZINE, APPROX. 7 3/4 BY 10 3/4, WITH 144 PAGES. 25 vintage magazines titled “The Workbasket and Home Arts Magazine. They range in publication dates from 1964 to 1967. Some are worn but the majority are in decent condition especially considering their age. NEEDLECRAFT MAGAZINE October 1929 ISSUE Reginald P. Ward Cover Crafts! NEEDLECRAFT MAGAZINE October 1929. Just a ton of creative ideas in just one magazine! For you who love to be creative, this magazine will have you spell bound and so excited with ideas galore and ideas.never go out of style! This listing is for the 4"x6.25" 26 page paper covered booklet shown. Special sections are devoted to Shaker wheels, patent wheels, and famous makers. In addition, there is extensive coverage of chair wheels, Irish castle wheels, double flyer wheels, and an appendix with over 1000 makers and their marks. Condition of cover is rough almost detached. Pages show use but are clean and unmarked. LOT OF WORKBASKET MAGAZINES. Years from 1969 to 1977. 90 issues included. Ooodles of ideas for your imagination. "MCCALL'S STEP BY STEP SEWING BOOK". REVISED GUIDE TO SMART SEWING.182 FULL-COLOR PHOTOGRAPHS AND OVER 500 DIAGRAMS. BOOK [PAPERBACK], APPROX. 8 1/8 BY 11 1/8, 160 PAGES PLUS COVER. CONDITION: MINOR WEAR AND YELLOWING, MINOR WRITING, A COUPLE SMALL EDGE TEARS. Small sewing machines have been sold as toys for girls for nearly 100 years. Book Title: Collector's Guide to Toy Sewing Machines. Antique Toy Sewing Machines by: D. & R. Matter. You won't receive heavily thumbed shelf copies from us! From the booklet; " Since the way to a man's heart is through his tummy, rescuing hot pots and pans from the fire is a woman's lot! ". these booklets are full of fun illustrations too. Soft bound 22 pages 8X11". Sewing book is in very good condition. Lots of pictures and illustrations. Very interesting and informative from decades past. This magazine has writing on the cover. It is in very good condition. FAIRCHILD'S NEW YORK DIRECTORY. A FAIRCHILD BLUE BOOK DIRECTORY. The pocket-size directory has a thumb-tab edge. 1957 Calendar. and other sewing & textiles related products. For your consideration is this Illustrations of Modern Lace 1902. "SIMPLICITY" SEWING BOOK UPDATED! SEWING AREA IDEAS. THE 70'S GREATEST LOOKS. PAPERBACK BOOK, APPROX. 8.25 BY 11, 256 PAGES. The standard book in the field, it gives information to identify the age, material, and desirability of any button that may be found. It covers buttons of every imaginable type, price range and age. May All the joys of spring. 15 page instructional booklet. Mad Hatter. Black Cat Trick or Treat. We take pride in our many clearly focused photographs. Local pick up is not available, already carefully bubble wrapped and cushioned. Local pick up is unavailable.